Highbrow Vapor recently sent me four of their flavors to try out. Always on the lookout for new flavors, I was excited to try them out and was not disappointed. The first thing I noticed when I opened the box was that the bottles inside were well packed and there was no odor indicating leakage. 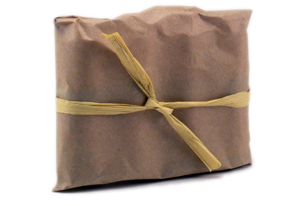 The second thing was that Highbrow Vapor adds an extra touch to their packaging by wrapping the bottles in brown Kraft paper and tying it with twine. The impression of bygone days fits right in with their top hat logo. 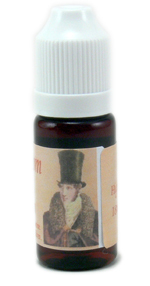 The gentleman from the 1800s also appears on the bottle on nicely designed bottle labels. Pertinent e-liquid information such as flavor, strength, volume and mix date is printed on the label. The only thing missing is the ratio of PG to VG, which is simply represented by “mix,” indication a 80/20 PG/VG mix. The bottles come tightly sealed with child-proof caps. All flavors mentioned below were 18mg. Highbrow Vapor has made it a point to offer customization. “Add double flavoring”, “Not too sweet”, “Add a bit of hazelnut” and “Extra throat hit” are some suggestions that are made for creating an individualized bottle of eliquid. Additional flavors can be added to the existing lineup to create truly customized e-liquids and at the bottom of each page are suggestions for complimentary flavors. Dark Chocolate Mint was the first of the Highbrow flavors to hit the atomizer and it is the easiest to review. Quite simply, this e-liquid tastes exactly as the name suggests on both inhale and exhale. Vapor production is excellent and throat hit was good, although the smooth mint flavor takes the bite out of it a bit. The dark chocolate component is also smooth with none of the bitter aftertaste found with some chocolate flavors. This makes for a fantastic vape along with the evening coffee. I typically find Hazelnut e-liquids to be a little overpowering in their nutty aspect and it is consequently not one of my first choices for flavoring. Highbrowbacco – Hazelnut Cream was a nice surprise in this respect. The dominant flavor is rich tobacco, while the addition of the hazelnut and cream seem to add depth rather than competing flavor. Vapor production and throat hit are both excellent. Highbrowbacco (Apple) is similar to the hazelnut blend in that the apple adds just a subtle overtone to an enjoyable tobacco. In this case the combination results in a slightly sweet vape. There is a hint of apple in the inhale, while it is barely noticeable on the exhale. Once again, vapor and throat hit are excellent. Ordering a bottle of Highbrowbacco for comparison purposes with no added flavor is high on my list of priorities. Highbrow Vapor’s take on RY4 with Highbrowbacco RY4 is interesting as well and again is dominated by tobacco with the additional flavors coming through in subtle measure. Caramel and vanilla are slightly perceptible on the inhale. The flavor is smooth and mild but not exceptionally sweet. The exhale contains lightly woody and smokey notes and otherwise consists almost entirely of tobacco. Vapor production is excellent, while throat hit seems a little milder than the other tobaccos, but is still quite good. If the flavors sent for trial are any indication, Highbrow Vapor should soon have a loyal following. The quality of the flavors, particularly the richness and depth of the tobaccos, is exceptional. The selection of flavors on the site is adequate, but the willingness to customize makes the combinations almost limitless. 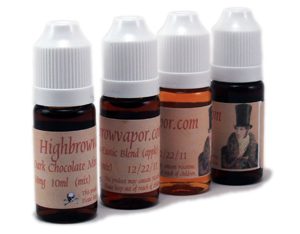 Highbrow Vapors definitely earns a spot on the recommendations list. Note: Highbrow Vapor is now a supporting supplier of Vaping Guides and sent samples at no cost for review. 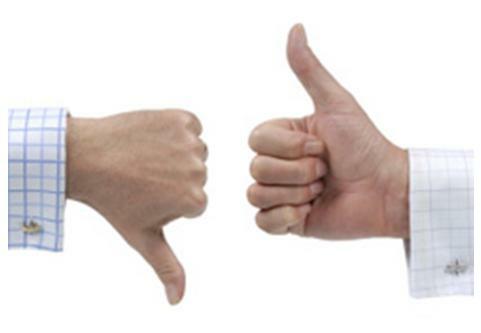 As with all reviews, I have striven to let neither of these facts influence an honest evaluation of the product. Great review. Read about these guys on ECF and just got my bottles in today. Vaping their Caramel (with coffee & cream added) in a 70vg/30pg 12mg mix (have pg sensitivity). And there is no flavor loss. It’s a magnificent vape, the caramel coming in subtly under the cream and coffee flavor. It’s like drinking a Caramel Latte. Bryan is a magician. Highbrow offers all VG which is great. My favorites are heavenly macaroon, amaretto, vanilla bourbon! !, cheesecake torte! !, and pure pear. The apricot is great added to RY4. I have not received any bad flavors from them at all and customer service is excellent. I didn’t care as much for the mint dark chocolate but I got it this summer — maby more of a winter vape? The Highbrow Vapor people are e-liquid magicians! I am impressed with every aspect of this company. Excellent product, great presentation, wonderful prices, and superior customer service. Thanks to both of you for adding your own positive experience to Eric’s review! I really like their liquid also … especially that Hazelnut Cream. What is the closest flavor to V4L's 555 recipe?